Very aromatic, with rose petal, peach and honeysuckle aromas. Full bodied, bright, zesty and crisp, this wine is extravagant and extroverted. Try it with aged Munster cheese and raisin-walnut bread. 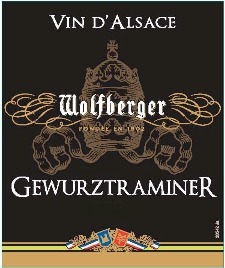 Wolfberger Cremant d Alsace Rose Brut is 100 % Pinot Noir. The harvest occurs mid September, usually two weeks before the harvest for still wines, when the grapes offer the best balance. Only the healthiest grapes are hand selected and gathered in small crates. Vinification: gentle pressing of whole grapes is followed by temperature controlled fermentation in stainless steel tanks. After bottling, bottle fermentation takes place in cellars at 12°C. A minimum of 15 months bottle aging before disgorging ensures ripeness. Lovely delicate salmon color with active, small bubbles. Round and full-bodied, this Crémant Rosé displays beautiful watermelon and strawberry aromas cascading in a smooth finish. "This light copper salmon sparkler of Pinot Noir has a lively fresh mousse and clean light cherry aromas. It is dry and crisp on the attack offering delicate raspberry flavors and a dry finish. Delicious." This clean and crisp style of wine displays delicate peach aromas with a hint of almonds. Smooth on the palate, it is balanced, with a creamy texture and a clean finish. This is a Greyton WO. Balance is the key to this wine. Viognier is an aromatic and generous varietal, it benefits from barrel maturation and lees contact with a fuller mouth feel and increased texture. This combined with the firm acid backbone and intense fruit will allow this wine to integrate beautifully and gain further complexity over the next 3-5 years. Rich, lush and decadent. Viognier is a gorgeous variety. Honeysuckle, peaches and dried apricot with a lingering citrus finish. A clean fresh acidity supports the extravagance of the nose and the palate. Viognier, a traditional Rhone variety is perfectly suited to Lismore’s cool-climate terrior. The vineyard block is on decomposed shale and one of the healthiest and well balanced on the farm. The entire team looks forward to the Viognier harvest and the beautiful amber tinged berries. The grapes were picked at optimal ripeness and whole bunch pressed, slowly extracting the juice at a rate of 500ltrs per ton. The juice was settled for 48 hours and was racked into burgundian barriques (1st fill) for fermentation and maturation. The wine was left on the lees with regular “batonnage” for 11 months. - Free range duck breast smoked with Darjeeling tea and coriander leaves. Set on a cinnamon poached pear glazed with a gooseberry jus. In both of these dishes, the fruit and floral aspects of the wine are complimented by the exotic and aromatic elements in the dish which are also highlighted by the spiciness from the oak fermentation; the fresh acidity freshens the palate, and yet the Lismore Viognier has the body to hold up against the weight of the duck or the tuna. It is also gorgeous with a well laid cheese platter. "The 2017 Age of Grace comes from purchased Viognier fruit from Elgin grown on rose quartz soil. It has a well defined bouquet of yellow plum, mirabelle, apricot blossom and subtle popcorn aromas. The palate is clean and precise with a fine line of acidity, hints of stem ginger complementing the tropical fruit (passion fruit and peach skin), and the finish is spicy and quite persistent. Excellent.- Neal Martin"
"Bottled but not yet labeled, the 2017 Age of Grace Viognier is made with Elgin fruit grown on rose quartz soil. Although made oxidatively, it’s very floral in character with notes of jasmine and honeysuckle. Samantha attributes this in part to natural ferment and the partial use of polyurethane egg, which contributes an extreme florality. It’s a lovely wine with bright, dense tropical and stone fruit on a full, creamy palate and showing good minerality on the finish."